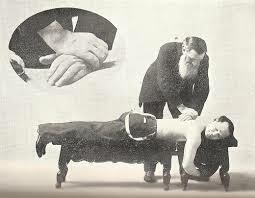 Chiropractic was founded in 1895 by Daniel David Palmer, a grocer with an intense interest in metaphysics. Prior to his “discovery” of chiropractic, D.D. Palmer was a magnetic healer. He also had interests in phrenology (diagnosing disease based on the bumps of the skull) and spiritualism. Palmer reported to have discovered the principle of chiropractic when he allegedly cured a janitor of his deafness by manipulating his neck. The fact that the nerve which conveys sound information from the ears to the brain does not pass through the neck did not seem to bother Palmer, if he was even aware of this fact. Palmer created the term “chiropractic,” which literally means “done by hand,” to refer to his new therapy. He argued that all disease is caused by subluxated bones, which 95% of the time are spinal bones, and which disrupt the flow of innate intelligence. He did not subject his ideas to any form of research, but rather went directly to treating patients and to teaching his principles to the first generation of chiropractors. Palmer believed in the pre-scientific vitalistic notion that health stems from the flow of a spiritual life force. Although vitalism was rapidly declining within scientific thought by the end of the 19th century, it was the centerpiece of early philosophies of health in most cultures. Palmer borrowed this ancient belief and renamed it “innate intelligence” which he claimed flowed from the brain to the rest of the body through the spinal cord and peripheral nerves. All disease, he argued, results from disruption in the flow of innate intelligence. Disruption in flow is caused by spinal subluxations, which are small misalignments in the spine that compress the spinal nerves.